My husband and I spent the afternoon and early evening today with a former bandmate of mine who used to work with my husband. He mentioned the time our band played a party celebrating his 25th wedding anniversary. He was reminded of it because he and his wife will soon be celebrating their 35th anniversary. It made me think about another gig that took place about 18 or 19 years ago today. I was playing in a hard rock cover band with a guitarist, bass player and drummer. We had a pre-New Year's Eve gig booked at a club in a small town about four hours away. As usual, I drove and my passenger was the drummer: a huge, taciturn man with whom I had absolutely nothing in common. We arrived at the bar and set up our gear at the far end of the long, rectangular room. As soon as we started playing, it became clear that none of the patrons were the slightest bit interested in the band. They all stayed at the end of the bar where the pool tables were and never even glanced in our direction. We could have set up cardboard cutouts of musicians and played a record over the sound system and it wouldn't have made a lick of difference. We all crowded into one motel room that night. As the only woman, I got one of the double beds to myself. Unfortunately, nothing could drown out the sound of all of my bandmates' snoring. Our drummer was such a notorious drunk that he was barred from every restaurant and bar within a 10-mile radius of his house. With an open bar tab available to him on New Year's Eve, he drank himself into a near stupor before we had gotten halfway through our sets. Every song was way too fast or too slow, depending on the mood he was in when he started it, and nothing could prompt a tempo change once he'd gotten going. Luckily for us, the crowd was just as indifferent as ever. Once we'd ground through all four sets and gotten our money, the guys had to literally drag the drummer out of the bar. I'd never seen anyone that drunk before. I put my foot down and refused to have to deal with him in my truck all the way back home, so they stuffed him into the bass player's van and the guitarist rode back with me. I don't recall that I ever had another New Year's Eve gig after that, but I've been to some pretty awful ones that my husband has played. This year, neither one of us is performing, so we're planning on going to a party at some friends' house. I think that's probably for the best. On Sunday, I cooked pretty much all day. I made dinner rolls, an ice cream cake roll, pomegranate salsa and Big Soft Ginger Cookies. Aside from that, the only other thing I did all day was drive from grocery store to grocery store trying to find some fresh cranberries. I was supposed to get to my sister's house on Christmas morning around 7 a.m. to help her make stuffing (I was bringing the recipe and the celery) and get the turkey into the oven. Unfortunately, the Keeper of the Alarm Clock, my husband, forgot his promise to wake me at 6. I woke up at 7:30 and ended up having to talk my sister through celery-less stuffing preparation over the phone. In my frantic race to load the Jeep with gifts, a card table and chairs, and all the food I'd prepared the day before, I overlooked the cake roll in the freezer. That's right, I forgot the Christmas dessert. According to my sister, I'd also promised to make a pumpkin cheesecake, but that slipped my mind long before everything else and I never even settled on a recipe or bought the ingredients. Continuing with the theme of forgetfulness, I realized about an hour after dinner that I'd never made the cranberry sauce. After all those trips to the store specifically to get cranberries... With the amount of coffee I drank that day, you'd think I'd have been more alert, but you'd be wrong. Still, those were minor quibbles in the grand scheme of things. We all had a good time, the food we did have was delightful, and the gifts were thoughtful and generous. The only damper on the day the news that James Brown had died. My husband played drums in James' backup band, James Brown's Famous Flames, back in the 1980s. When I saw how sad he looked upon hearing the news, I wished I'd waited until later to tell him. I don't go back to work until next Tuesday, so I'm going to settle down with the many books and DVDs I received as gifts and drink in entertainment until looming housework intrudes upon my conscience. Are you working this week or are you off? If you're off work, what are you doing to keep busy? I almost never watch dramas or "serious" movies. Real life is serious and dramatic enough! I prefer comedy, science fiction/fantasy, action/adventure and kids' movies. The only exception is that I have been seeing a lot of documentaries lately, mostly about the environment. Even though my iTunes library is jam-packed with heavy metal music, I still have a soft spot for the music I grew up with, particularly anything sung by Julie Andrews. A friend gave me a Julie Andrews CD at my bridal shower as a joke and didn't quite know how to react when it became clear that I loved it. I originally named my oldest cat "Galileo," but I kept forgetting what I'd decided to call him (Copernicus? ), so I ended up switching his name to "Kato." I still have all of my Nancy Drew and Oz books from childhood and I'm looking forward to sharing them with my niece when she's older. My favorite places to shop are Lowe's and Home Depot. If money were no object, I'd remodel my whole house, inside and outside, until everything was exactly the way I want it. So I suppose it's my turn to tag some people. I guess I'll go for Pharmgirl, Cagey, Dorothy, Goofy Girl and Jeremy. For the last photo in this week's series, we've jumped to the 1980s. 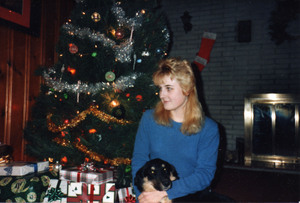 I wore my hair like this for a long, long time and it never occurred to me except in retrospect that it was a mullet. Ah well, live and learn. Yesterday I finished the last of my gift shopping, so I'll be ready for all of my holiday celebrations as soon as I make one last trip to the grocery store. My cooking assignments for Christmas day: chocolate cake roll with peppermint ice cream filling, pomegranate/mandarin orange salsa, dinner rolls and maybe cranberry sauce. You might have noticed that I recently moved all my recipes to the upper right navigation area. Next year (maybe as early as next week if I'm feeling really motivated), I'm going to create another blog devoted entirely to recipes and cooking. It will be part of this same account, but with a different look and feel and plenty of photos. The focus will be largely on recipes collected by my grandmother that encompass five generations of my family, but I'll also share recipes that I've created or gotten from friends. Have a delightful holiday, and to quote Ze Frank from yesterday's episode of "the show," "If you get overwhelmed by family or overwhelmed because you're celebrating by yourself this year, just breathe...it'll all be back to normal soon enough." As you can see from the photo, I've always been a big fan of Christmas presents. This year, I ended up getting gifts from several friends for whom I hadn't bought anything. When I was younger, I probably would have agonized about it, apologized, made up excuses, etc. Instead, I decided that the best course was to thank the givers effusively, follow up with written thank-you notes, and plan to make it up to them on their birthdays. That sounds reasonable, don't you think? Cecil and Britches: No Santa Today - A short film about a sock monkey and a donkey doing their best to spread holiday joy. I'm guessing this is from the early seventies, judging by the apparent age of my sister and my '70s-tastic pants. 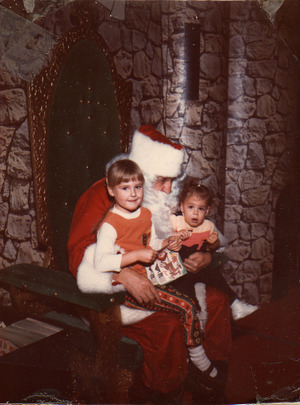 I have quite the collection of photos with Santa, all taken against this cardboard castle backdrop. Santa's throne is pretty fancy, though, don't you think? Sadly, the mall where we used to go every year to shyly mutter our wish lists to the Big Man was recently razed and replaced with a gigantic Wal-mart. Well, I found it. With a level of goofiness that only a kid can muster, I decided one year that red jumper + Santa hat = elf. 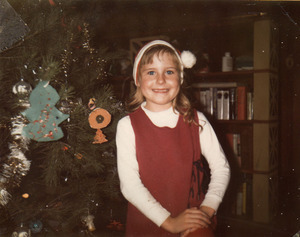 My favorite thing about this photo is the crude paper ornaments adorning the tree - oh, and the bookcase made of cinder blocks and boards that was de rigeur in every middle class household of the 1970s. The Christmas tree would shed needles onto the books and we'd keep finding them well into the following year. Incidentally, this is the least scary this photo has ever been because the magic of Photoshop allowed me to fix the demonic red eyes that I had in this and every other Christmas photo I found. Tomorrow: A visit to Santa in his cardboard castle. 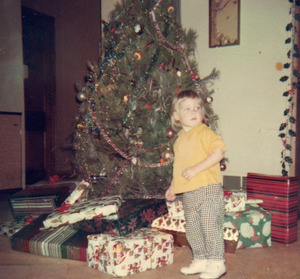 I'm starting my series of old Christmas photos with one that was taken long before I was born. 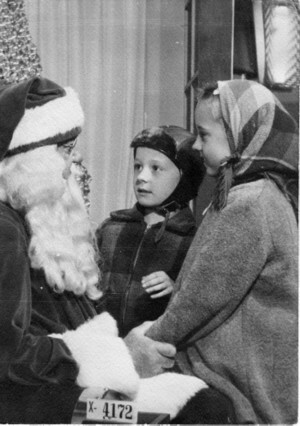 This is my uncle and mother visiting Santa sometime in the late '40s or early '50s. My uncle looks like he's putting in his bid for a Red Ryder BB Gun. I didn't find a lot of black and white holiday photos in my collection, even though I ended up with the lion's share of the family photos when my mother and grandmother passed away. I'm going to look through my old scrapbooks and baby book to see what I else can come up with for later this week. I'm keeping my fingers crossed that I can dig up a photo of me at age seven or eight dressed as an elf. It's 7:33 a.m. and I'm sitting in my home office in my pajamas surfing my Bloglines feeds and listening to iTunes in shuffle mode (now playing: "Dream Warriors" by Dokken). If it weren't for my oil change appointment at 8:45, I wouldn't have to get dressed until midday. Today I'm taking my last full vacation day of the year. As much as I'd like to take it easy, I have a bazillion things on my schedule, including the aforementioned oil change which will inevitably take far longer than I'd like, lunch with a friend, another visit to the vet for my cat, housecleaning, and holiday decorating. My niece is spending the night tonight and staying all day tomorrow so we can bake cookies and go Christmas shopping. Our guest room is still packed to the metaphorical rafters with drums, tubs of office junk, large empty boxes, and miscellaneous music gear, so she's going to have to sleep in my dressing room. Fortunately, six-year-olds are small. I'm ridiculously close to being finished with my holiday shopping. I really need to get the tree up and wrap everything before I forget where I put some of my purchases. There are a few online orders that probably won't make it here in time, but I'm sure the recipients won't mind. Next week: holiday photos from my youth (assuming I can find the right USB cable for my scanner). Gmail has been down since yesterday evening and that's a bad, bad thing. Aside from the Yahoo e-mail account I use for this blog, all of my e-mail accounts are in Gmail. The worst part is that it seems to be just me. My husband was getting into his account just fine until I tried to log into mine on his computer. Now it's stuck in Average Jane Denial/Server Error Mode and he's probably going to have to clear his cache to get back in. Even though I'm all antsy to be able to check my e-mail, the truth is that I don't get that many messages every day. However, I do store a lot of stuff that it would be nice to be able to access, so I'm not just whining here. I guess I'll have to try again from work and see if I have any better luck on a different network. I'm keeping my fingers crossed that the problem goes away. Update: Woohoo! I'm in. If it still doesn't work at home, I'm guessing there's some kind of firewall problem with our network. I sure hope not, but I'm sure IT Hubby can fix it if there is.